Theres goods news, and bad news. Good News: I found a good spot for the fennel patch! They come back yearly, and shouldn’t be planted near other vegetables. So this is in the back and out-of-the-way. It’s my fault really. I bought the blackberry plants from a local individual, because they were supposed to be heirloom, and organically grown. Unfortunately, they also were infected with orange rust. Mine wasn’t this severe, yet. But orange rust is a systemic problem. 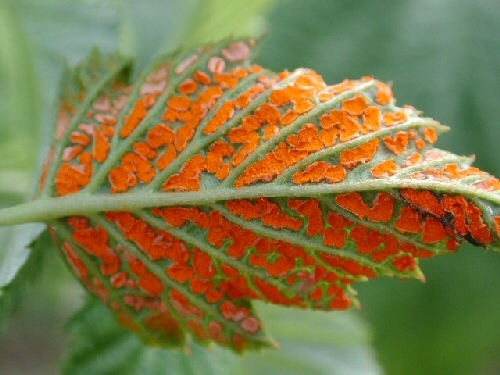 It infects the whole plant, and the symptoms show up on the leaves-at first. And it returns year after year. It stunts the growth, and we wouldn’t get many berries, if any at all. There’s no treatment for it. It’s not supposed to spread to anything we have planted, but I figured why take the risk. We have wild brambles all throughout the woods, and if it spreads to them, we’d likely be unable to ever have successful blackberries. Talk about a bummer. I could taste those blackberries since I planted them….Oh well, this fall I’ll buy from a reputable source, so if it happens again, I can return them!